Trying to predict what will happen in South America’s wildest emerging markets in 2015 has the degree of difficulty of trying to compute pi to the 100th digit in your head. With Venezuela, in particular, the range of options of what could happen next year is almost as infinite – ranging from more of the same and muddling through, to default, violence, coup, civil war and international brigades. On the economic front, whether Venezuela survives 2015 will depend almost purely on the price of oil, however. Venezuela is facing a set of serious economic problems that thus far the country’s leadership under former Cuba-trained bus driver Nicolas Maduro seems unable, unwilling and woefully unprepared to deal with. Inflation – officially clocked by the government this summer at over 64 per cent – is in reality running at over 120 per cent. Rather than give evidence of how bad the economy is, the government simply stopped publishing pesky economic statistics. The government has not even bothered to publish GDP figures since 2013. While the bolivar is not readily convertible into dollars because of currency controls that value the dollar mainly at a rate of 6.3 bolivars – a 28th of what the black market does – the free market price for the dollar has doubled in the last three months to 180 bolivars from just 90 in September. With the price of Venezuela’s oil – which, because of its heaviness, trades $5 to $7 cheaper than West Texas Intermediate (WTI) – hovering at just over $50 a barrel, falling oil production and heavy domestic consumption (gasoline is less than a penny a gallon at the black market rate), Venezuela – as the holder of the largest oil reserves in the world – finds itself in dire straits. Out of an anaemic 2.5m barrels per day of production (Saudi Arabia produces 9.6m bpd), Venezuela uses 800,000 bpd domestically. In addition, it provides 100,000 barrels a day to Cuba free, and sends between 250,000 and 450,000 barrels a day without payment to China – paying back loans of $50bn from the Asian dynamo. In short, Venezuela is left with income from just 1.3m to 1.5m barrels per day (the majority of which are sold to the US). But here is the problem: at $50 a barrel, 1.5m bpd produces a total of only $27.38bn a year. At $60, Venezuela’s sole export produces just $32.85bn a year. And there is the rub. In 2012, Venezuela – whose limited domestic production of consumer goods has been destroyed by 15 years of expropriations, price controls and communism – spent $55bn to import goods. In 2013, the shortage of dollars had cut imports to $44bn and shortages of everything from toilet paper to autoparts began to bite. In 2014, imports for the nation of over 29m have tumbled to around $36bn and shortages of everything abound. In addition to the cost of imported goods, Venezuela has maturity and interest payments on its foreign debt of around $11bn in 2015. The maturity schedule in the first half of the year is relatively light, with the country’s only maturity a 1bn euro 7 per cent bond that comes due in the Ides of March. But in the second half of the year, what makes for a frightening Halloween/Guy Fawkes period for investors is that Venezuela and PDVSA must pay $3.4bn in bonds and $1.7bn in interest for a scary total of $5.8bn. If oil has not recovered by then (or worse still, continues to deteriorate) and Venezuela is still shut out of international capital markets (where its bonds are currently trading at yields of 50 per cent), it could be lights out for the Bolivarian Republic, which has already quietly and seemingly unnoticed defaulted on the bonds of steel company Sidetur, which it expropriated in 2012. Meanwhile, if 2014 has taught us anything, it is that bondholders can sometimes be a very patient lot. Like Venezuela’s Sidetur bondholders, holders of Argentina bonds are extraordinarily quietly waiting to be paid. While Argentina defaulted on its foreign debt in July, its bonds have managed to maintain 80-90 per cent of their values – even though bondholders are not getting billions in interest due. I believe that even after the expiration of the Rights Upon Future Offers (Rufo) clause at the end of this month – which the Argentine government has blamed for its inability to negotiate with the pre-2001 defaulted debt holders led by Paul Singer and his hedge fund NML – the Kirchner government will still be unwilling and unable to reach a settlement with the holdouts and those Argentina bond prices that have held up so well will move closer toward joining their Venezuelan cousins in the tank. Thankfully, Argentina will hold a presidential election on October 25 and a new administration will take office there in December 2015, which will provide an exit from a financial strategy that has all the hallmarks of being designed by a petulant teenager. Venezuela, sadly, has no such easy exit strategy from its financial folly. 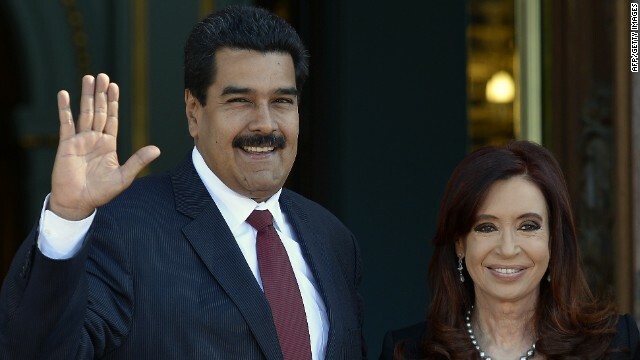 This entry was posted in Andean Region, Caribbean, Southern Cone, Uncategorized and tagged 2015, Argentina, Debt, Economy, fernandez, kirchner, Maduro, NML, oil, Venezuela. Bookmark the permalink.